- (To my dear friends, Charles & Jeanne Manfred. I thought I had found such a place some time ago when my friends, the Manfreds of Hollywood, and erstwhile residents of Sorrento told me some time ago that they were here for a while and fully intended to go over and check out the "north forty" and see how much acreage the Italian state owes them by now, lo, after many centuries of said deadbeat state's neglecting and dodging of earnest letters from Los Angeles and the Manfreds' legal fleagles, Dewey, Fleeceham & Howe. "Oh?" says I. "And where might that be?" Har. Chuckle. Good one. You almost had me there. Manfredonia. (I thought of my favorite such fictional place, Freedonia, ("Land of the Spree and the Home of the Knave!") from the 1933 Marx Brothers movie Duck Soup and my favorite scene, in which Groucho starts pelting Mrs. Teasdale with fruit when she starts to bellow the Freedonian national anthem. "Sorry," says Groucho. "We can't stop till the fruit runs out." Hail, Freedonia, indeed. And the same for Manfredonia. Pick me up a check for Matthewstan while you're at it! 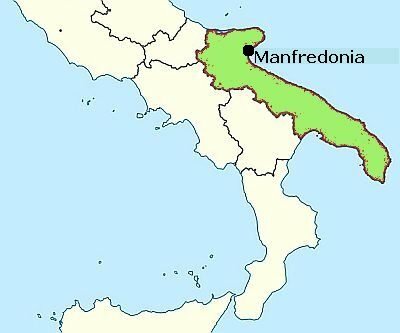 Of course, as I am mortified to report, there really was —and still is— a Manfredonia, built by and named for one of my Hollywood Manfred's great-greats. It's a coastal town in the province of Foggia in the modern Italian region of Apulia (green area on map), just below the spur of the boot of Italy, Monte Gargano, on the Adriatic. The current population is just under 60,000. The area is very historic and, according to legend, was settled as "Sipontum" in ancient times by the Greeks, indeed, by none other than Diomedes, one of the great warriors in the Iliad. Even for Italy, the area overflows with conspicuous history; Sipontum is just a few miles north of a small village with the curious name of Canne della Battaglia [Canne of the Battle] (now part of the nearby town of Barletta). It is on the Ofanto river, the site where in 216 BC Hannibal pulled off one of the greatest tactical feats in military history, inflicting a massive defeat on the numerically superior armies of Rome at the Battle of Cannae. Sipontum then became a Roman colony in 189 BC. Much later, in the 1100s it was an important Norman county. The old city of Siponto was abandoned after the 1223 earthquake and the swamping up of that part of the coast. Modern Manfredonia was built by King Manfred between 1256–1263, just north of the ruins of ancient Sipontum. He planned a city with fortifications and broad, straight streets as his father, Frederick II of Hohenstaufen, had done in similar ventures earlier. Manfred was no doubt intent on fulfilling his father's dream of reconstituting the Holy Roman Empire as a grand Ghibelline (anti-papal) enterprise centered in the south. (Father Frederick had been a tireless builder of towns and fortresses. See this link for more.) Manfredonia has collected many legends and stories about itself, this one from an interesting volume called The Land of Manfred, Prince of Tarentum and King of Sicily. Rambles in Remote Parts of Southern Italy, by Janet Ross (London, John Murray, Albermarle St. 1889). [For the new cathedral of his new town, Manfred commanded...] that a huge bell should be made that might be heard fifty miles inland, so that succour might come if Manfredonia was assailed by enemies while it was yet sparsely populated, and from that hour they say the king means to take from the big towns of all Apulia so many families from each city to make of Manfredonia a town of three thousand hearths. The bell did not remain long at Manfredonia, for Charles of Anjou sent it as an offering to the shrine of St. Nicholas at Bari, where eventually it was melted down into money. of the Manfredonia city hall. Manfred. The historical Manfred (1232-1266) was born in Venosa in the southern Italian province of Potenza, about 100 miles south of Naples. He was a natural son of the emperor Frederick II of Hohenstaufen (d. 1250), one of the most powerful of all Holy Roman Emperors. Manfred's mother was Frederick's lover, the Piemontese noblewoman, Bianca Lancia (or Lanzia), whom Frederick married on her deathbed, no doubt to legitimize the son, Manfred. Sources say that Frederick regarded Manfred as legitimate and as his "favorite son." The quickest gloss over the change from Hohenstaufen to Angevin dynasties in southern Italy is simply to say that Frederick's death was followed by a few decades of struggle between his decendants and French Angevin usurpers (plus the pope) to see who got the kingdom of Sicily (all of southern Italy). That might pass a short-answer quiz, but it leaves out a lot of the juicy stuff. Actually, Frederick had provided in his will for an orderly transition of imperial power (to his half-brother, Conrad IV) as well as of royal power in Sicily (to Manfred, who would rule Sicily as a representative of the new emperor). Manfred apparently acted loyally and acknowledged Conrad when the latter showed up in Siponto in 1252 to see how things were going down south. Together they solidified the still-Hohenstaufen state but had a falling out. Conrad then died in 1254, leaving his imperial throne to his young child, Conradin, with Manfred acting as a regent. This set the stage for open and armed intervention by Papal and Angevin troops to move on the kingdom of Sicily. The war that followed started out well for Manfred. 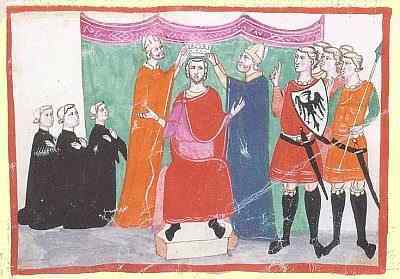 Within a few years he was crowned King of Sicily and even lay claim to the Holy Roman Imperial crown when the rumor circulated that Conradin had died (untrue). The battlefield, however, settled matters once and for all; Manfred's army met French and Papal forces near Benevento in February, 1266. (This is where the soundtrack starts playing Schumann's Manfred Overture behind the battle; it is the most über-romantic piece of über-German Romanticism ever über-composed. It's an anachronism, yes, but when you're slinging battle-axes and armor around, it sure beats Hildegarde von Bingen.) Manfred lost and was killed in battle. The Angevins took the kingdom and mopped up by executing the child-king, Conradin, by beheading him at Piazza Mercato in Naples. Yet, it was too short a time to know if Manfred was really a "chip off the old block" of Frederick II. Maybe, maybe not. He finished some of his father's manuscripts, inherited Frederick's bent for polyculturalism, remaining on good terms —and utilizing— the Hohenstaufen garrision of Muslim (!) troops at Lucera. His short life has been romanticized (overly, no doubt) in music and literature (Byron's poem, Manfred, uses the name but the character is unrelated to the historical Manfred.) In the Divina Commedia, Manfred puts in an appearance in Canto III of Purgatorio so pope-baiter Dante can get in some licks by turning Manfred into a martyr to the evils of papal expansionism. Manfred's city has survived attempts at toponomastic vandalism; the victorious Angevins wanted to call it Sypontum Novellum (New Sypontum). Ho-hum. It remains Manfredonia. At Naples there is a legend that Manfred's widow, the beautiful Helen, was murdered, with two of her children, in the Castello dell' Uovo [sic], and that on All Souls Eve a ghost, with long wavy hair and a sceptre in its hand, used to be seen gliding along the passages into the chapel. With the sceptre the spirit touched a lapidary stone in front of the altar, which slowly rose, and from it came two children, who threw themselves on to her breast. Then all three knelt in front of the statue of Our Lady, lifting their hands in prayer. The Virgin, turning to the infant Christ, said to Him, "Sweet Son, give ear to the unfortunate."... Then the infant Christ dipped His finger into the blood which gushed from the breast of Helen, and wrote " Revenge " on the altar. It was vain to try and wash out the word. On All Souls Eve every year it was renewed, until the night of the Sicilian Vespers, when French blood ran in streams; after which the ghost of the beautiful Helen was no more seen crying for revenge. Utopia, an ideal human society, means "no place" and was the name of a book by Sir Thomas More published in 1516. Shangri-La, the mythical and harmonious Himalayan paradise, is a fictional place described in the 1933 novel Lost Horizon by British author James Hilton. Ruritania is a fictional country in central Europe which forms the setting for three books by Anthony Hope: The Prisoner of Zenda (1894), The Heart of Princess Osra (1896), and Rupert of Hentzau (1898).